The death of Mary Margaret Louise Pettigrew, 89, of Springhill, occurred on Thursday, September 6, 2018 at All Saints Hospital. 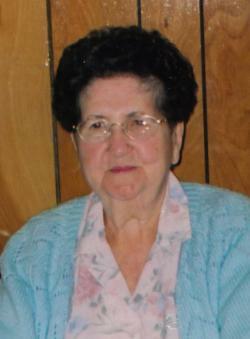 Louise was born February 24, 1929, a daughter of the late Peter and Elizabeth (Melanson) White. Louise worked as a telephone operator in Springhill before moving with her husband to Waltham, Mass, where they resided for many years, making many friends before returning for their retirement. She will be fondly remembered by her sister, Hazel Sterling, of Springhill, as well as numerous nieces, nephews and dear friends. Besides her parents, Louise was predeceased by her husband Arthur Pettigrew in 2005; a brother, Henry Babineau; a sister Alma McKay, as well as a sister, Anna, in infancy and her great nephews, Terry Canning, George and Muir McKay, and her great niece Louise Tabor. Arrangements are under the care and guidance of A.H. Brown Funeral Home, 5 McFarlane Street, Springhill (902-597-2361). Honouring Louise's wishes, there will be no visitation or funeral service. A graveside committal service will be held at the West Brook Cemetery on Tuesday, September 11, 2018 at 1 pm. Donations in memory of Louise may be made to the Heart & Stroke, The Canadian Kidney Foundation or All Saints Hospital Palliative Care. Sharing of memories and condolences may be sent to the family by visiting Louise's online memorial at www.brownsfuneralhome.com or through the A.H. Brown Funeral Home Facebook Page.